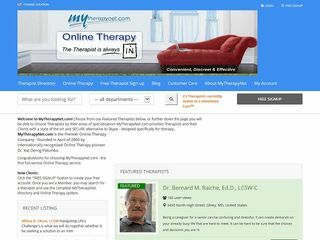 Description: My Therapy Net Inc is a business categorized under psychotherapists, which is part of the larger category offices of health practitioners nec. My Therapy Net Inc is located at the address 20501 Ventura Boulevard in Woodland Hills, California 91364-2337. The CEO is Kathleen Derrig-Palumbo who can be contacted at (818)961-0204.